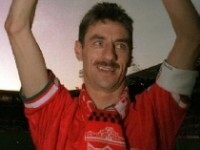 One of the Reds greatest ever goalscorers. together these kinda things for the rest of us to enjoy. Is Zone Press caused mistake? We have all heard about, and have opinions on, Rafa’s like of a zonal defence. But I’ve wondered for quite a while now if the idea of ‘zones’ doesn’t extend all over the pitch. When I watch games now it seems that there is hardly any movement at all from players without the ball. (Sadly, it is not like this with Arse or the Mancs!) If you watch, the man brings the ball out of defence or from midfield and the rest of the team is pretty much static. There is usually very limited options for the pass to be made. Is this because all (with the exception of SG?) are told to keep to their “zones”? I remember (well, I don’t remember exactly, as I can’t recall the exact quote!) Shankley saying something along the lines: “A team should attack in packs”. Only movement gives the man with the ball options for a decent pass. I think, maybe, Craig Bellamy is a real case in point. At Blackburn, last year, he was terrific. All over the place and defenders couldn’t get near him. (John Toshack also commented after the Wales game last night: “he’s playing in a straight jacket at L’Pool”). At the moment, with Sissoko out, I’d have Gerrard deeper and Garcia behind the front two. What do you think? You are currently browsing the archives for the From This is anfield article category.